First, the theologian need not be a genius, but he must bring to the study the following personal qualities: (1) He must have a love of learning and an insatiable thirst for the doctrines of Scripture; (2) he must be able to organize the material he studies and correlate it with what he already knows; and (3) he must be disciplined to go no further than what is written and be content simply to think God’s thoughts after Him. This final quality requires not only mental discipline but intellectual humility as well. In sum, systematic theology builds its structure with the material that correct exegesis provides, and this structure then aids in later exegesis and vice-versa. Third, the theologian must have a holy affection toward God. David captures this in Psalm 25:14: “The secret of the Lord is for those who fear Him, and He will make them know His covenant.” “Secret” translates sodh, a word immediately describing intimacy and confidentiality; in fact, the NIV puts it this way: “The Lord confides in those who fear him.” This word is found in contexts more explicitly describing revelation, such as Jeremiah 23:18, 22 and especially Amos 3:7. Therefore, David seems to be asserting here that fearing the Lord s (or holy affections are) directly related to an increased ability for understanding God’s revealed truth. Further, Paul suggests in Romans 12:2 that in order to know and approve the will of God, the believer must both yield himself sacrificially to God and avoid conformity to this resent godless order (“world”: aion). As Murray notes, the will of God here is the “will of commandment,” essentially the will of God “as it pertains to our responsible activity in progressive sanctification.” That said, sanctification obviously requires that Scripture be properly applied and obeyed (which activities themselves require correct understanding and correlation). Therefore, Paul implies here that a yielded life–a holy affection for God–is a requisite for understanding God’s written will and, thus, for doing theology. Finally, the theologian must have divine illumination. He needs this not only to mitigate his inherent depravity but also to enable him to appreciate and correlate the significance of the text throughout his life. Here it is also important to note that this ministry of the Spirit is bound up with various ordinary means, summarily the diligent study mentioned above. This is to say that the Spirit’s illumination works organically through the interpreter’s mind as the interpreter actively engages in the learning process. 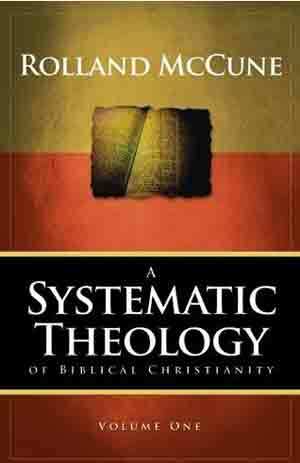 Rolland McCune, A Systematic Theology of Biblical Christianity, vol. 1 (Allen Park, MI: Detroit Baptist Theological Seminary, 2009), pp. 31-34. This entry was posted on Tuesday, May 12th, 2009 at 9:52 am and is filed under Uncategorized. You can follow any responses to this entry through the RSS 2.0 feed. You can leave a response, or trackback from your own site.